In 1835 Sydney trader Thomas Mitchell purchased much of Auckland from Apihai Kawau for £160. However, having been sold and resold, the purchase was subsequently disallowed by the Land Claims Commission. In 1841, Ngati Whatua rangatira Apihai Te Kawau, defined from the summit of Mangawhau what would become the largest Polynesian city in the world, with a 3,000 acre gift of land to the colonial government. In 1844, 110 acres near the junction of Dominion Road with New North Road was purchased by Thomas Cassidy. 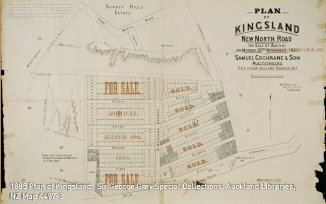 By 1847 Governor Grey reported that land within a seven-mile radius of Auckland had been sold. Once surveyed and divided the land was subsequently offered for sale. In 1852 fifty-five acres of land at Kingsland was purchased by John McElwain. A gift of an adjoining sixty acres from his brother George substantially increased the size of his farm. In 1867 the settlers of Mt Albert, Morningside and Kingsland formed the Mt Albert Highway District Board. Settlers in Cabbage Tree Swamp Road petitioned the Highway Board to have name of their road changed to something more appealing. The new name of ‘Kingsland Road’ was agreed to in 1877, and the district near the city end of the road came to be known as Kingsland. In the early 1880s public transport came to Kingsland with rail and bus connections to the city. This was the catalyst for the commercial and residential development of the neighbourhood. John McElwain recognised that the time was ripe to subdivide his farm and in 1882 two hundred and twenty seven allotments were laid out with Kingsland Avenue and First, Second, Third and Fourth Avenues providing access. Prices for allotments in the subdivision ranged from £28 to £100. Eden Park was at the low point of Cabbage Tree Swamp, with the road running in a causeway across it. Eden Park has been in existence as a sports ground since 1900 and by 1914 the ground was drained and turned into two ovals. Eden Park is the home of the Blues Super 14 team, hosting Auckland’s home games in the NPC and its successor the Air New Zealand Cup. The ground has also been a frequent host of international test rugby and in a switch of codes, hosted the 1988 Rugby League World Cup final. It was the focal point of the 2011 Rugby World Cup. The first Kingsland railway station was built in 1881 on the Auckland to Helensville line, which opened in 1880. The proximity of the station to the main street is not found in most other suburban centres in Auckland. By the 20th century Kingsland was a well-established residential suburb. In 1903 trams began plying the route from the city terminating at Pages Store. There was always a very strong connection of the railway station with the town centre, which continues to be reinforced with the development in 2005 of the present Rail Plaza. The Kingsland township contains buildings from a range of eras. The building containing Atomic Cafe was built in the 1960’s as a car showroom and still has its original sliding doors. The neighbouring building is older, built as a billiard hall and shooting gallery around 1930. This living project has been initiated by the Kingsland Business Society Inc. Should you wish to contribute to this ongoing project, please email us or call us on (09) 379 5553.